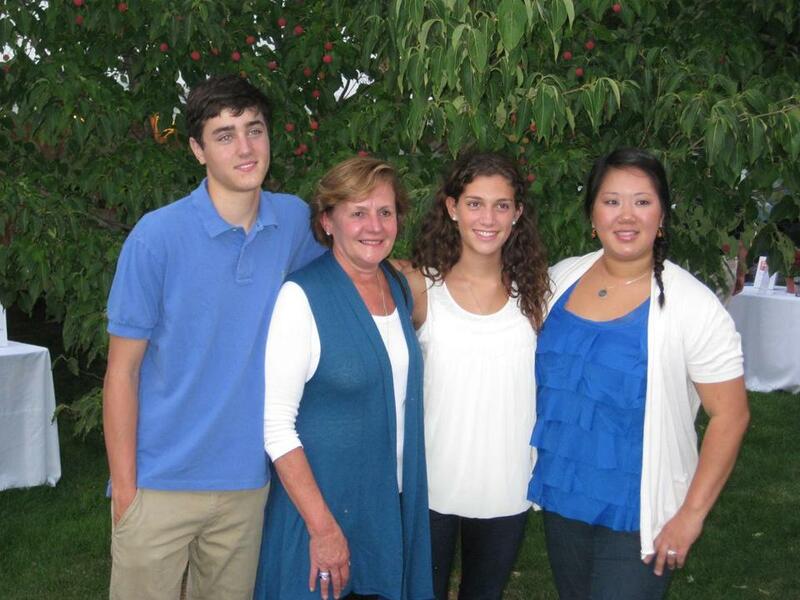 The family of the late Paul R. Matthews of Canton (from left): Alex, Suzanne, Kate, and Julia Matthews. Two local foundations – The Jeff Coombs Memorial Foundation in Abington and the Paul R. Matthews Foundation in Canton – continue the charitable work started by the widows of the men whose names the foundations bear. Christie Coombs, wife of Jeff Coombs, who died in the terrorist attacks of Sept. 11, 2001, started her foundation two months after her husband’s death. The group has raised money for families across the state affected by death, illness, or other circumstances that force hard times upon them. The foundation just held its annual road race, the group’s major fund-raiser. Suzanne Matthews, wife of Paul R. Matthews, created her foundation following the 2009 death of her husband, a longtime school board member and advocate for youth. Its major fund-raiser is coming up Friday. The 12th annual Jeff Coombs Memorial Road Race and Walk was held Sept. 8 in Abington. Over the year s, the race that has raised around $300,000, Christie Coombs said. The race honors those killed in the 9/11 attacks and all military serving in war, she said. A new group of honorees were added this year: victims of the Boston Marathon bombing attack in April. A familiar face was the official starter this year: Carlos Arredondo, who rushed into the Marathon bomb scene to assist victims, and was captured in a now-iconic news photo helping Jeff Bauman in a wheelchair, after he had applied tourniquets to Bauman’s injured legs. Also at the race was a couple, Paul Norden, who lost a leg in the blast, and Jacquie Webb, who was also injured. Webb, who with Norden lives north of Boston, has ties to Abington, Coombs said, with cousins in the area and a late aunt who lived there. The ideas come from her children and friends, she said, including a recent one that sent a man and his young daughter to a Taylor Swift concert. The wife is suffering from cancer, Coombs said, and the family needed a break. Norden and Webb also got a check from the foundation at the race last week, Coombs said. The spirit of the foundation is one Jeff Coombs would have embraced, his wife said, and plays into his giving soul. The whole Coombs family chips in, she said, including daughter Meaghan, who while working as a waitress in New York City when the Marathon bombing occurred, donated her tips for the night along with other wait staff, netting $1,200 for the foundation in her dad’s name. The foundation matched the amount and, with other donations, assisted three local families affected by the bombing. And that would suit her husband fine, she said. For more information on the foundation, visit www.jeffcoombsfund.org. Matthews believed strongly in sports and civic involvement of youth, said his widow, Suzanne, who created the Paul R. Matthews Foundation following his death four years ago. He was a longtime member of the Canton School Committee and advocate for the community’s youth, she said, adding that the foundation in his name supports the youth of Canton through scholarships and programs. The foundation’s fourth annual “Celebration of Community Spirit” is being held at Pequitside Farm in Canton Friday at 7 p.m. In addition to a silent auction, raffles, and refreshments, this year’s event features a performance by Rene Rancourt, longtime national anthem singer for the Boston Bruins. The fund-raising events enable the foundation to provide annual scholarships to Canton High School seniors and grants to a variety of programs, including the television production classes at Canton High, the Canton Historical Society, the Canton Garden and Food Project, the Canton High School Robotics Program, and several other educational and community programs. Tickets to the event are $35, and can be bought at www.prmfoundation.com. Regular updates, including auction and raffle items, can also be found on the foundation’s Facebook page at www.facebook.com/paulrmatthewsfoundation. For more information, call 781-828-0989, or e-mail pmfoundation@aol.com.